"Union Station, Portland, Maine circa 1936"
A glowing night scene with businessmen arriving after a long day's work and shoppers returning from Boston. All are greeted to fresh falling snow at Portland's Union Station. Portlanders still fondly remember this landmark which was dismantled in 1963. Some research went into this scene. I used a 1920's Reo for the bus, an early 1930's Ford for the smaller taxi and I turned my Grandmother's 1936 Pontiac into the far left taxi. First in the Portland Series. Signed, numbered, limited edition print of 500. 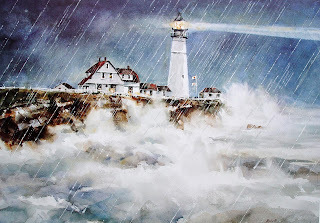 Image size: 16 3/4" x 24 5/8"
"Night Rain At Portland Head Light"
This scene captures a heavy surf crashing against tidal rocks as the oldest and most famous lighthouse in the country shines it's warning light into the Atlantic. I made the sketches and took photographs one October afternoon between rain squalls. Second in the Portland Series. Signed, numbered, limited edition print of 500. Image size: 17 1/4" x 24 3/4"